Why Should I Consider Shooting Black-and-White Photography? What’s the Best Way to Print Black-and-White Photos? When researching black-and-white photography, you might come across the term “monochrome photography.” But don’t be fooled, all black-and-white photography is monochrome photography, but not all monochrome photography is black and white (sort of how all bourbon is whisky, but not all whisky is bourbon - the same is true here). Any photography that solely uses different shades of grey (on the black to white scale) in the final image. Similarly, a monochrome photo is one that uses different shades of any other one color to create the final image, so you could have a monochrome photo that uses all red tones, etc. Sometimes abbreviated as B/W or B&W, black-and-white pictures originated from a technological and cost limitation, as early as 1800. During this time, different techniques were constantly being tested and utilized to produce rough images. Early processes included one using leather treated with silver-nitrate. Using glass plates was the most popular method, even with the advent of plastic film in the 1890s because the glass created a sharper image. As film overtook glass, black-and-white photography persisted through the early 1900s because color photos were very expensive to produce and the hues of color captured were often wrong. Plus, people just liked the “classic” look of black and whites. It wasn’t until around the mid-20th century that color photography really started to catch on, largely thanks to Kodak introducing the first integral tripack, which was able to capture three different colors in a multi-layer emulsion (a light-sensitive colloid, usually coated onto the substrate of film). Today, black-and-white photography has become an artistic niche for photographers looking to expand their technical style or break out of their comfort zone. Take it away again, James Trapp! There are a ton of options for printing your photo to canvas, metal, or on tried-and-true photo paper. ●	Photo Paper Prints: A matte finish would be ideal. Matte photos are great for pictures of buildings or statues, where you want high clarity, but without overly vibrant color. Matte finishes are typically used in black-and-white shots, formal shots like a wedding, and larger-sized pictures because a matte finish can show off a lot of detail. ●	Canvas Prints: Let’s face it, photos on a USB-drive or in a photo album go in a drawer or closet somewhere. A canvas gets to be seen! 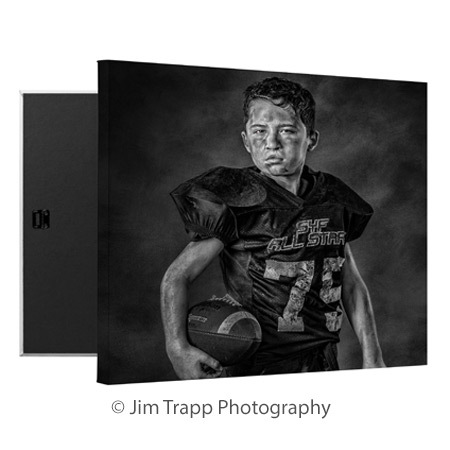 Every guest your client has will stop and take notice of your amazing photo printed on an artist-grade canvas wrap, turning your black-and-white photo into black-and-white art. ●	Metal Print: When it comes to really making a statement with your photos, metal prints are a jaw-dropper. Using a process called “dye sublimation,” we infuse dyes directly onto scratch-resistant sheets of aluminum, which creates a unique luminescent effect that gives your black-and-white photos a life-like depth and dimension. ●	Framed Fine Art Prints: : Give your photos a complete, professional finish that’s ready to easily hang on the wall. Framed fine art prints are available in four timeless styles including Modern Black, Modern White, Espresso, and Classic Black. Each photo print comes with a pure white double-mat with a protective acrylic face. For black-and-white shots, we’d recommend a Fujicolor Crystal Archive Super Type II PDN Satin Lustre paper finish to reproduce the deepest blacks and ideal textures for black-and-white photography. Bring your black-and-white photography to life at CG Pro Prints today. We offer the best pricing and quality on prints—anywhere. Plus, we ship in just three days so you or your clients can enjoy your black-and-white prints as quick as possible. Need more inspiration? Check out our gallery of black-and-white photos from James Trapp!